In 2020, a sculpture of Susan B. Anthony and Elizabeth Cady Stanton are due to be unveiled on the Mall, the first statue in the city depicting women. They will be holding a scroll naming and quoting 22 other American women whose work is considered significant, including Sojourner Truth, Ida B. Wells, Mary Church Terrell, and four other African-American women. Strawberry Fields, near Central Park West and 72nd Street, is a memorial commemorating John Lennon's death at the nearby Dakota apartment building. The city dedicated Strawberry Fields in Lennon's honor in April 1981. The memorial was completely rebuilt and rededicated on what would have been Lennon's 45th birthday, October 9, 1985. Countries from all around the world contributed trees, and Italy donated the "Imagine" mosaic in the center of the memorial. It has since become the site of impromptu memorial gatherings for other notables. For sixteen days in 2005, Central Park was the setting for Christo and Jeanne-Claude's installation The Gates, a piece that had been planned since 1979. 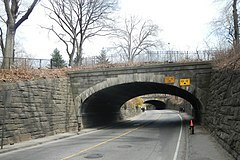 Although the project was the subject of mixed reactions, it was nevertheless a major, if temporary, draw for the park. Some activists, celebrities, and politicians have questioned the ethics of this tradition and called for it to end. The history of accidents involving spooked horses has come under scrutiny with horse deaths. Additional media accounts have corroborated some charges, but they have also shown that the standards vary from stable to stable. Both activists and horse owners agree that part of the problem is lack of enforcement of the city code. Supporters of the trade say it needs to be reformed rather than be shut down, and that carriage drivers deserve a raise, which the city has not authorized since 1989. Some replacements have been proposed for the carriage horses, including electric vintage cars. 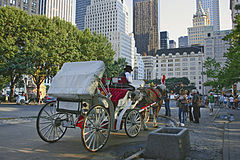 Mayor Bill de Blasio, in his 2013 mayoral campaign, pledged to eliminate horse carriage tours if he was elected, but as of August 2018[update], had only succeeded in relocating the carriage pick-up areas. ^ Pollak, Michael. (July 3, 2014). 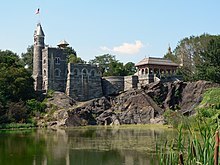 What Is Jamaica, Queens, Named After?, The New York Times. Retrieved July 6, 2014. ^ Another Horse Down in Central Park Archived September 24, 2008, at the Wayback Machine, Blog of the ASPCA, September 17, 2007; accessed August 23, 2008.